Foodborne infectious diseases still represent an important public health problem and are an important cause of morbidity and mortality worldwide. 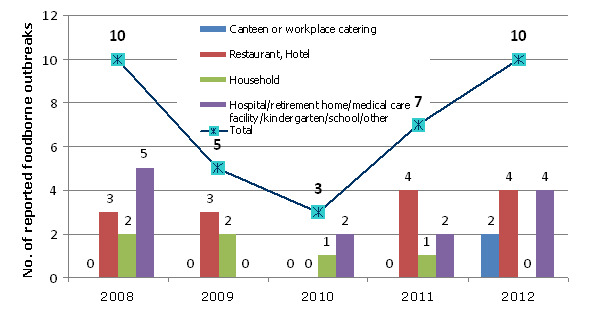 In the period of 2008 to 2012, Slovenia reported 293 different outbreaks. The largest group of outbreaks were caused by Norovirus, spread by person-to-person transmission (200), followed by food-borne outbreaks (35) (National Institute of Public Health of RS, 2013). Fromthe analysis of the reported outbreaks caused by food it is evident that there is little epidemiological outbreaks of well-processed and validated. Only in one case has been laboratory confirmed the causal link between the outbreak and the consumption of certain foods (isolation of the same pathogen in patients and from ingested food), even fewer are the causal relationship is confirmed by analytical epidemiological study (evidence of links between the consumption of certain foods and disease in persons in the outbreak, using either cohort studies or case-control studies). National Institute of Public Health, 2008-2012.